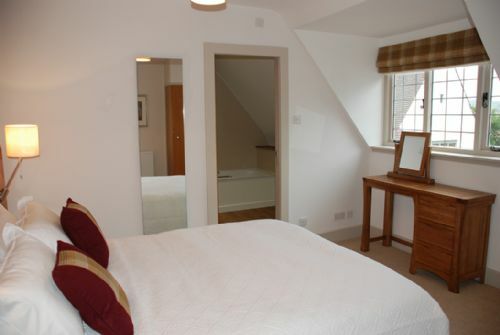 The Giddy Limit is our first floor apartment with 3 en-suite bedrooms. It is situated on the North West corner of the building and has its own balcony overlooking the garden with views over towards the River Tay. It is designed with a mixture of contemporary and antique furniture with lovely tweed Moon fabrics. 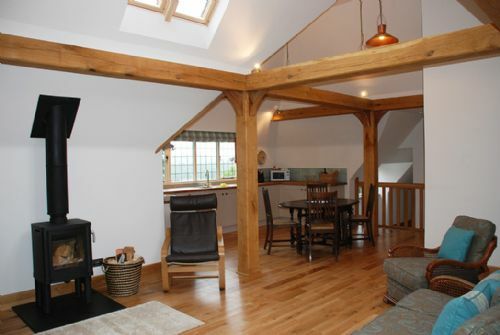 The open plan living area is very spacious and has a wood burning stove to keep you cosy on the Winter nights. 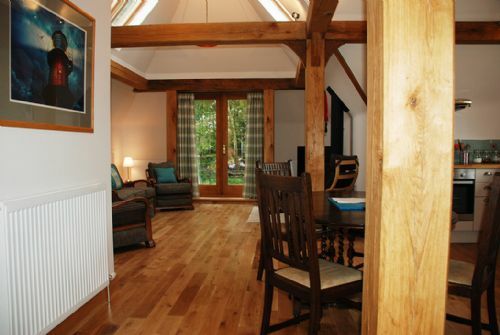 Designed with oak posts and beams, and a solid oak floor - it really is The Giddy Limit! The fully equipped kitchen has a full size dishwasher, washing machine, fridge, freezer, induction hob, electric oven, microwave and coffee machine. The living area has an antique Bergere suite recently recovered in Moon fabric and has a 40" Freeview TV + DVD player. There is a Sonos sound system and free superfast WiFi. The apartment has three bedrooms - bedroom one has a king size bed which can be split into twin beds and has an en-suite bathroom with a ppwer shower. 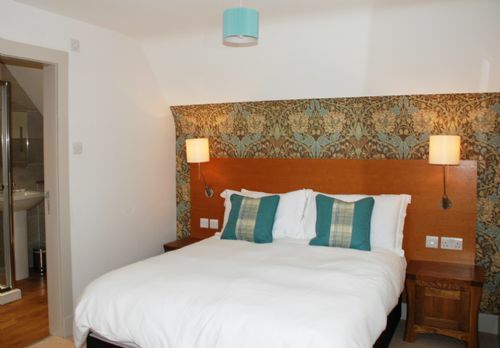 Bedroom two also has a king size bed which can be split into twin beds and has an en-suite shower room and bedroom three has a double bed and an en-suite shower room. All en-suites are fully tiled and fitted with power showers. The apartment has its own entrance and is accessed through the courtyard. This is our second time staying here family of 2 adults and 3 children. We had the most amazing time again! The properties have been so beautifully restored and the owners Evelyn and Ralph are such lovely people, so friendly helpful and informative about the area. Spotlessly clean and well equipped with everything you could possibly need, so comfortable and cosy. The area all around is just great in all directions, so much to see and do and lovely places to eat if you are foodies like us! We will be back for sure! Great Arts and Craft house, super welcome and assistance form the hosts. Accommodation was spotless and very well furnished. Perfect location for Dundee, St Andrews and further afield. Already saving up for another visit!! We have just returned from an excellent break at New Year where we stayed in the property called th Giddy Limit a Sandford. We had an excellent stay there and found the property to be in first class condition, it was immaculate and very cosy a home from home. The owners Evelyn and Geoff were amazing they were very helpful and we found that nothing was too much trouble to them and they dealt with anything we asked immediately also their knowledge of the area eg eating places and even the butchers where we got a marvellous steak pie for our New Year celebrations was second to none. All in all we had a wonderful stay and we would highly recommend this property. We were there in a large party there were 20 of us and we used the other properties too which were also of a very high standard a good place for a family celebration. Excellent self-catering property set in lovely location. 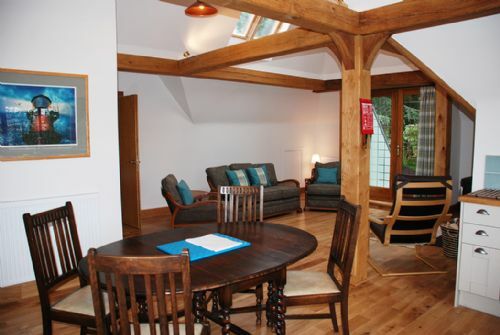 The Giddy Limit is a lovely self-catering apartment. Beautifully furnished and equipped with everything you need for a short stay. Nice toiletries and a lovely welcome basket provided. WiFi was excellent. Set in a lovely location and just a few miles from excellent restaurants. 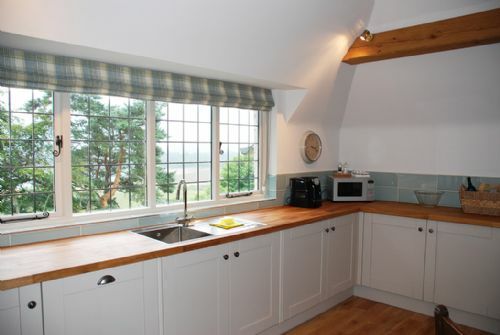 We highly recommend Sandford Country Cottages. We stayed at the property as part of a larger group and found the apartments to be in excellent condition. The welcome basket provided was a lovely touch and the hosts were very helpful if and when we had any specific queries. The location was very handy for getting to St Andrews and we would definitely recommend staying here to anyone who is looking for high quality accommodation in this area. Thoroughly enjoyed our stay at ‘The Giddy Limit’. Evelyn was so welcoming and made us feel at home straight away. The ‘Welcome Pack’ was most appreciated and contained everything we coul need for our first night there (crusty loaf, butter, milk, coffee pods, biscuits and wine). Accommodation was first class, large spacious rooms and full of light with complimentary toiletries in every ensuite bathroom. We were fascinated by the history of Sandford House and Evelyn kindly arranged a tour of the public rooms of the main house (her home). In the reception area there is information available on the history of the house including photos of how it has changed over the years. There is a selection of games and puzzles available for guests to use which were most appreciated. Sandford House sits amidst beautiful countryside and the views around it are stunning. There is easy access to Tayport, Dundee, and St Andrews - where we spent a lot of time walking through the town and enjoying the things it had to offer. We can recommend the Cinema (not a large cinema but it does have 3 screens); Nardini’s and Jannettas Gelateria for ice cream (delicious); Tailend for amazing fish and chips; The Cathedral, the Castle, University and the Preservation Trust Museum House for history and ambience; the Aquarium and Botanic Gardens - the list could go on and on for there is so much to see and do in the area and Sanford House provides a quality, warm, relaxing base to return to each evening. We would highly recommend it to anyone considering a visit to the area. A group of us stayed in the Giddy Limit over a weekend and had a fabulous time! 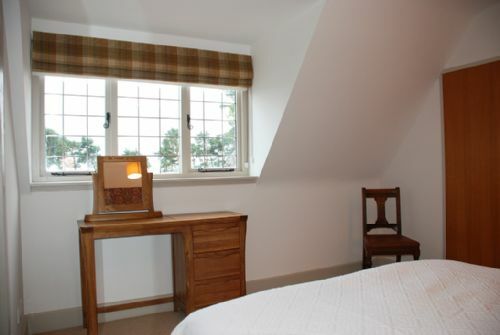 The apartments are immaculate and were fantastically equipped for your stay with a lovely basket of goodies on arrival. The little balcony area was such a lovely peaceful place to have a morning coffee and just enjoy the fresh air. Great location with not too far to go for local amenities and day trips as well. Thanks Evelyn and Ralph for a wonderful stay! 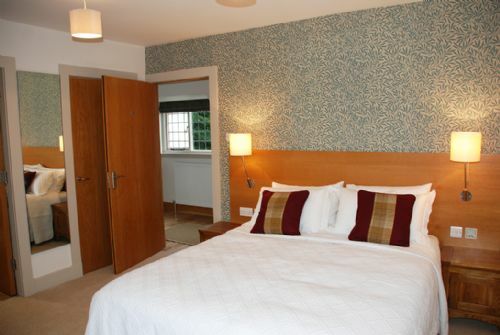 We were delighted to stay at Sandford. Everything was perfect. We can warmly recommend and would be very happy to visit again. Gorgeous accomodation - super clean and spacious. Immaculately clean and comfortable. Set on lovely grounds with stunning views. Evelyn our host is always on hand and extremely accomodating. We were really happy with everything. A wonderful stay in The Giddy Limit at Sandford Country Cottages. We would definitely recommend the accommodation - 5 star in every aspect. Fabulous location and beautiful surroundings. 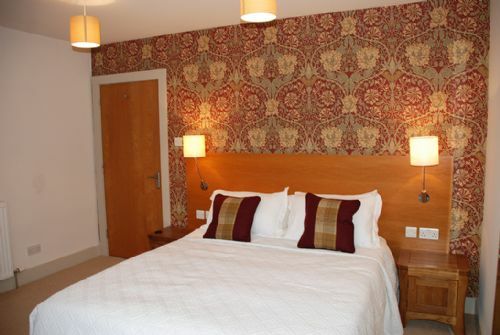 A lovely, clean and confortable place to stay at reasonable distance from the city center of Dundee. Thank you for the review. However we were disappointed to only receive 4/5 for Service, Condition and Value. The apartment sleeps 6 people but you arrived with a total of 11 people and expected them to be able to sleep on the floor and the sofas! We had already relented and put in two extra beds to accommodate 2 extra children, which turned out to be 3 children. We pride ourselves on being helpful, as you can see from our other reviews. The apartment was spotless when you arrived, but was incredibly dirty when you left, so dirty that it took our cleaner 3 times longer to clean it than normal, and someone had been smoking in the small bedroom with the window open! I had to fill 10 bin bags of rubbish that had been left all over the apartment, including all the packaging from your shopping trips. Most of our guests are very happy to leave our apartments the way they find them, perhaps I did not make this clear on your arrival that this was what was expected. Beautifully renovated and appointed apartment; delightful, exceptionally helpful hosts and a lovely situation. We plan to return. This was our second stay at Sandford Country Cottages, and our first time at The Giddy Limit. The purpose of our trip was to spend half term with our younger son near St Andrews where our older son is at University. Sandford Country Cottages are in a beautiful spot with views over the surrounding countryside and in a good position for visiting Dundee and St Andrews. 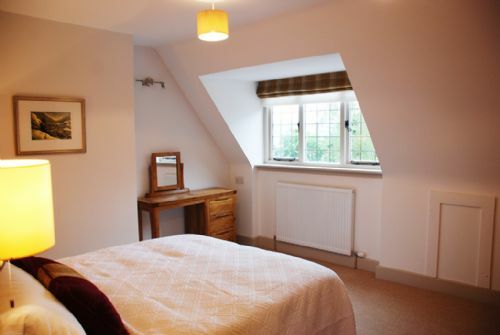 The Giddy Limit is a first floor three bedroom apartment which is really comfortable and kitted out well with a lovely kitchen and sitting room opening out onto a furnished balcony. We had a peaceful 5 day stay in The Giddy Limit. The apartment was beautifully clean with quality fittings and the welcome basket of food was perfect. 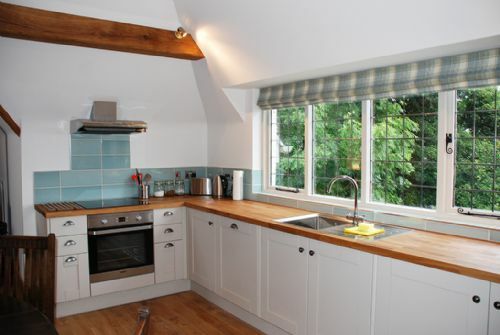 The history of the house is interesting and the conversion to holiday cottages very successful. Evelyn was a friendly and helpful host, unobtrusive but very happy to provide any information or information required. There are interesting walks nearby along the Fife Coastal Path. Our third stay at Sandford and we will definitely be back. Giddy limit cannot be faulted. It provides fabulous accommodation for a family gathering. Evelyn and Ralph are so welcoming and helpful. 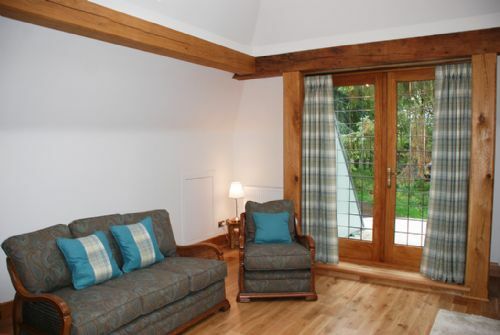 Beautiful home and holiday lets attached. Lovely location and short drive to St Andrews. Perfect for those travelling from further afield or for a short UK break. My friends of 4 and myself stayed at the Giddy Limit at Sandford Country Cottages for four nights and had wonderful time under the perfect conditions. The house was beautifully decorated and well furnished so we felt as if we were at home, even better than our home! Everlyn was available all the time and provided us with useful information around the area when needed. I would definately stay again at the Sandford Country Cottages next time I visit Scotland. 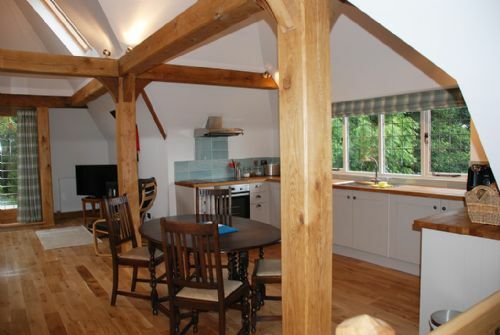 Cottage was done to high spec , everything from cutlery to the beams. Stayed here while working in the area. Was fully equiped for my needs. Would return.